Task List Guru is a free to-do list manager for the Windows operating system. It supports organizing tasks, task lists, notes and reminders in an intuitive interface. Tasks are sorted into To-Do Lists that are displayed in the left sidebar. To-Do Lists use a folder like structure which means that it is possible to create sub-lists and use different icons for each list which improves the manageability and recognition. New tasks lists are created with a double-click on the sidebar ,by right-clicking and selecting Add To-Do List, with the shortcut Ctrl-r or via the To-Do List menu of the menubar. New tasks are basically added the same way. The only difference is that the actions need to be performed in the task pane and not the sidebar. Tasks are defined by a name and due date. The task list manager offers several optional parameters that can be defined by the user. It is for instance possible to configure reminders, add notes, select a task priority or select a task type. The reminder notifies the user (by default with a flashing window and sound, optionally with an email) at the specified time, and before the due date, that the task has not been completed yet. Only text can be added to notes which limits the functionality a bit. Checkboxes are provided next to each tasks which can be used to mark them as completed. Both task priorities and types can be configured under the Manage menu. Here it is possible to add new priorities and types or change their appearance. 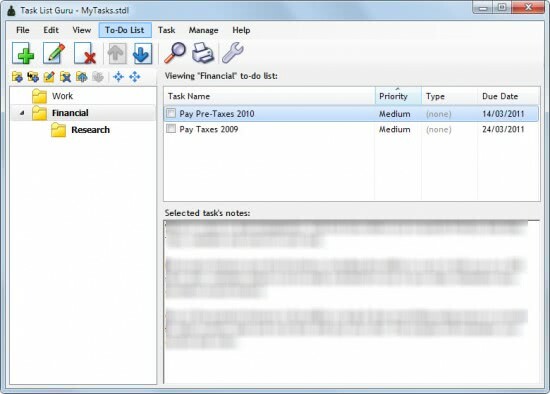 Task Lists can be printed on a connected printer or exported as HTML or csv files. 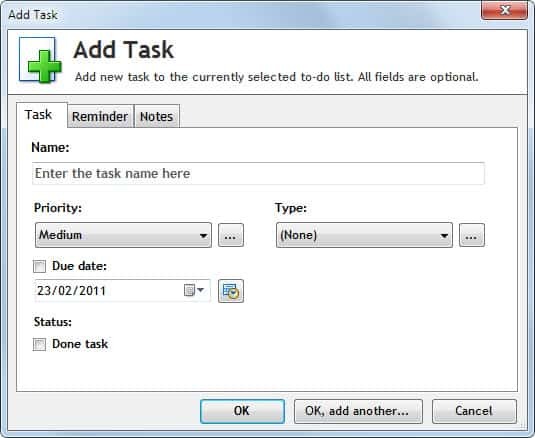 Task List Guru is an easy to use task list organizer for the Windows operating system. It comes with all the bells and whistles one would expect, except for syncing options with online task managers like Google Tasks. Windows users can download the free program that us fully compatible with 32-bit and 64-bit editions of Windows from the developer website over at Dextronet. Thanks for the review! Some of the online To-Do lists like Hiveminder (hiveminder.com) and Social To-Do List (www.socialtodolist.com) seem to have more features. It seems like the only thing Guru really has going for it is offline use.